Forty seven drilling permits were issued and 30 wells were drilled in 2013. Three companies drilled 27 wells for potash in the area of Petrified Forest National Park east of Holbrook. Kinder Morgan drilled three wells for carbon dioxide in the St. Johns Gas Unit between St. Johns and Springerville. Twenty seven wells were drilled east of Holbrook for potash in 2013. Passport Potash drilled six wells at its potash project west of Petrified Forest National Park. HNZ Potash drilled the Mine Shaft Core Well #1 at its potash project southwest of Petrified Forest National Park. HNZ cored through the rocks overlying the salt to obtain information relative to eventual construction of a mining shaft. American West Potash drilled 20 wells at its potash project east of Petrified Forest national Park. American West Potash cored two of its holes from the surface to total depth to obtain information relative to eventual construction of a mining shaft. The Oil and Gas Conservation Commission required a permit for the potash stratigraphic wells because the holes penetrate the Coconino Sandstone, a potential helium reservoir in the area of the Petrified Forest National Park. The Little Colorado River Plateau Resource Conservation and Development Area, Inc. developed a potash information website to provide information about potash mining and the Holbrook Basin. See the new website at http://www.holbrookbasin.org/index.html. Kinder Morgan tested several existing wells and drilled three new wells in the St Johns Gas Unit in 2013. Kinder Morgan plans to develop the St Johns Gas Unit as a major supplier of CO2 for enhanced recovery. Kinder Morgan anticipates drilling up to 250 wells, building a pipeline and ultimately delivering 450 to 500 million cubic ft of gas a day to the Permian Basin by 2016. Ridgeway Arizona Oil Corporation drilled the discovery well for the CO2 field in August 1994. 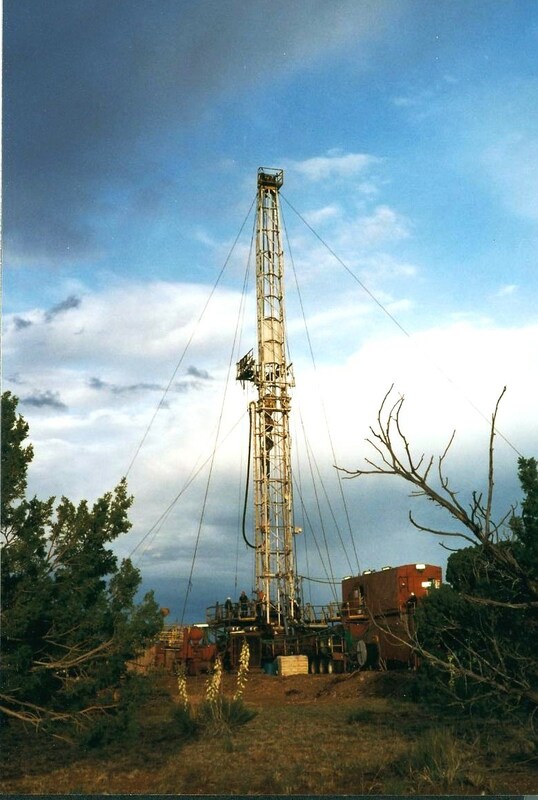 The accompanying photograph shows a rig drilling one of the CO2 wells in 1997. The AZGS joined the Rocky Mountain Carbon Capture and Sequestration partnership (RMCCS) to study CO2 sequestration potential across the Colorado Plateau region. RMCCS drilled a well to characterize the site-specific CO2 sequestration potential of geologic units in the vicinity of Craig, Colorado. Information from the RMCCS well is available at http://rmccs.org/updates.html. The AZGS determined that the Cedar Mesa Sandstone of Permian age has the capacity to store 0.70 billion metric tons of CO2 in northern Arizona. The Cedar Mesa Sandstone underlies the Navajo Generating Station near Page, Arizona. The AZGS also digitized oil and gas well logs into computer usable LAS (Log ASCII Standard) format to aid subsurface investigations using well logs and developed a user-friendly web application to make the digitized well data available online. 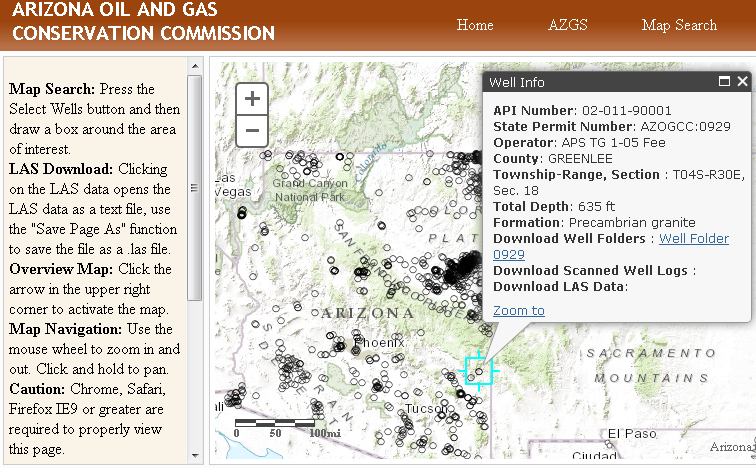 The online search and download map, the Arizona Oil and Gas Well Viewer, is hosted under the Online Data tab on the State of Arizona Oil and Gas Conservation Commission (AZOGCC) website. The AZGS plans to release a report in 2014 describing the results of its investigation of the sequestration potential of the rock units in northeastern Arizona. GreenFire Energy is investigating CO2-based geothermal energy technology near Springerville in east-central Arizona. Greenfire plans to use geothermally heated carbon dioxide to produce electric power but reported no activity in 2013. More information about GreenFire Energy is available at its website http://greenfireenergy.com/. There were 555,000 acres leased for oil and gas in Arizona as of June 30, 2013, up from the 504,000 acres at yearend 2012. Oil and gas leases on State Trust land totaled 515,000 acres as of June 30, up from 477,000 acres in December 2012. Federal land leased as of June 30 totaled 40,000 acres, up from 27,000 acres in December 2012. Yearend lease numbers are not yet available. Oil production totaled 32,256 barrels from 25 producing wells through June 2013, up from 21,290 barrels from 10 wells through June 2012. Gas production totaled 9.6 million cubic feet from 4 producing gas wells through June 2013, down from 85.6 million cubic feet from 5 wells through June 2012. No CO2 was produced in 2012 or 2013. There were two active disposal wells and 4 shut-in wells as of June 2013. Yearend production numbers are not yet available. The Oil and Gas Conservation Commission held four regular meetings in 2013. Current commission members include J. Dale Nations, Tucson, Chairman; Stephen R. Cooper, Casa Grande; Frank Thorwald, Phoenix; Robert L. Wagner, Mesa; and Vanessa Hickman, ex-officio member and State Land Commissioner. Links to rules and statutes and other information about oil and gas in Arizona including online well data and logs may be found at the Commission’s web page at www.azogcc.az.gov. In 2011, AZGS purchased Neuralog software to digitize Arizona well logs into LAS (log ASCII Standard) format to aid analysis for CO2 sequestration potential. The digitizing effort focused on deep wells across northeastern Arizona including wells that penetrated Precambrian basement and wells in the oil and gas fields with the highest cumulative production. We have since developed a user-friendly web application to make the digitized well data available online to facilitate the widest possible access and use of the data (Fig. 2). The search and download map includes more than 1100 well folders, 2500 scanned tiff images of well logs, and the newly digitized LAS data. The search and download map is accessed under the Online Data tab on the State of Arizona Oil and Gas Conservation Commission (AZOGCC) website. A total of 275 logs from 120 wells for a total of about 962 curves were digitized into LAS format through September 30, 2103.